RPM specializes in geothermal technology, which relies primarily on Earth's natural thermal energy—a renewable resource—to heat or cool a house or business. The only additional energy geothermal systems require is a small amount of electricity that they employ to concentrate what Mother Nature provides and to circulate high-quality heating and cooling throughout the home. RPM owns all the necessary equipment required for an installation of a Geothermal system including drilling machine for loop installation, and excavating equipment. RPM will customize an individual design that is best for your home or office application. Our qualified technicians not only are experienced with Geothermal installations they are also able to provide routine maintenance & services for all of your Geothermal needs. Homeowners who use geothermal systems give them superior ratings because of their ability to deliver comfortably warm air—even on the coldest winter days—and because of their extraordinarily low operating costs. As an additional benefit, geothermal systems can provide inexpensive hot water either to supplement or replace entirely the output of a conventional, domestic water heater. Call us today to receive more information on how to save money and learn why geothermal is the premium choice to homeowners and business owners like you! We'll provide you with a free consultation and evaluation of your current AC and heating system, and we'll give you a free estimate on new or replacement systems (financing is available). Everyone from our office staff, sales staff, and service department is here to assist you. Thank you for considering RPM for all your heating and cooling needs. 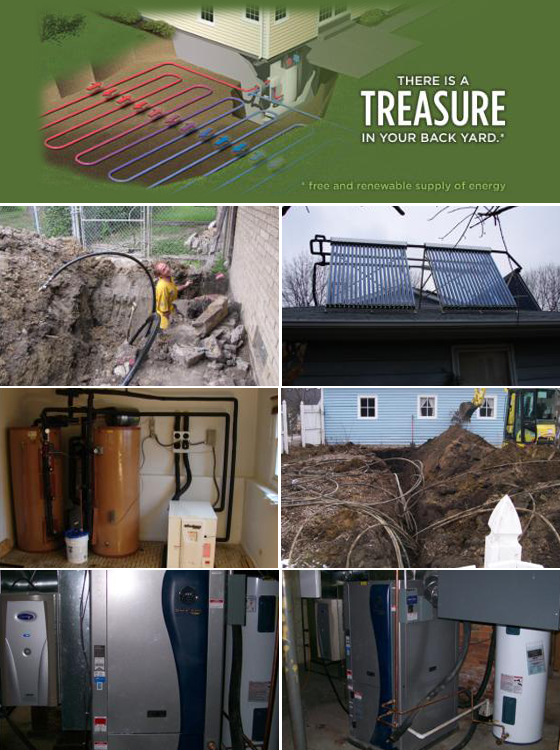 During the heating cycle, a WaterFurnace geothermal system uses the earth loop to extract heat from the ground. As the system pulls heat from the loop, it distributes it through a conventional duct system as warm air. The same heat energy can also be used for a radiant floor system or domestic hot water heating. In the cooling mode, a WaterFurnace geothermal system air conditions your home by reversing the heating process. Instead of extracting heat from the ground, it is extracted from your home and either moved back into the earth loop or used to preheat the water in your hot water tank. Once the heat is removed from the air, it is distributed through the duct system in your home. To determine how much you can save on your energy bills with a WaterFurnace geothermal system, use the WaterFurnace savings calculator. You can also save money with rebates on geothermal heat pumps. *We are a certified WaterFurnace dealer.